Valentine’s Day is always a special occasion. If you’re in a relationship, prepare yourself to buy your sweetie something nice and expensive. No matter if it’s a card, flowers, candy, or even heart-shaped pizza, the gift industry’s got you by the short hairs and are twisting your wallet. 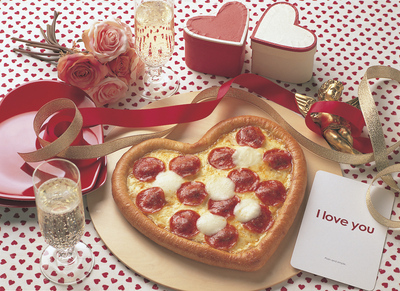 That’s why Domino’s Pizza in Japan is selling a medium-sized heart-shaped pizza for 1300 yen (about $14.50)! Papa John’s had a similar pizza offer last year, but apparently in Japan, on Valentine’s Day the women are expected to buy presents for the men, and not vice-versa. This particular promotion should go over like gangbusters when paired with an action movie, then! Normally, I’d avoid or outright refuse Domino’s Pizza. When I was in college, it’s the place that gave local students the biggest discount on a one-topping medium, so it’s basically all I ate. It was in a small town, so there was only Pizza Hut or Domino’s, no Papa John’s or local eatery to speak of, so I was kind of hamstrung. Either way, I grew to loathe Domino’s for its cheapness. However, I did give it another shot, thanks to their complete redesign of the company recipe. I have to say, it was a lot better. The crust is a little better thanks to the brushed-on garlic and herbs, even if the cheese and toppings are pretty much the same. The big improvement is in the sauce, where they’ve actually added spices to their former ketchup mix and turned it into the second-best part of the pie (after the garlic flavor of the new crust). It’s still not my favorite delivery pizza place, but it’s definitely edible.